A few days ago, my friend invited me for an interesting & unique heritage walk in Jaipur – Nahargarh water walk. 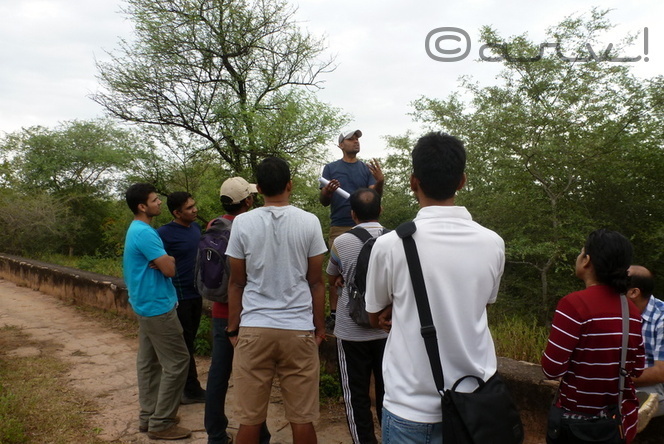 This water walk was conducted by a water management and conservation expert based in Jaipur. Nahargarh heritage water walk tries to uncover the methods of ancient water collection and rainwater harvesting system of Nahargarh Fort. There are two huge Baoris/ step-wells in Nahargarh Fort. Water walk uncovers the system of collection and channelizing rainwater into these water storage systems or Baoris/ stepwells. During last few years, Rainwater Harvesting has become a buzz word. Rain water harvesting techniques and water conservation have become very important in recent years. So much so that without rainwater harvesting process in place, construction of a new building or house is not permitted by the urban governing authorities in Jaipur. 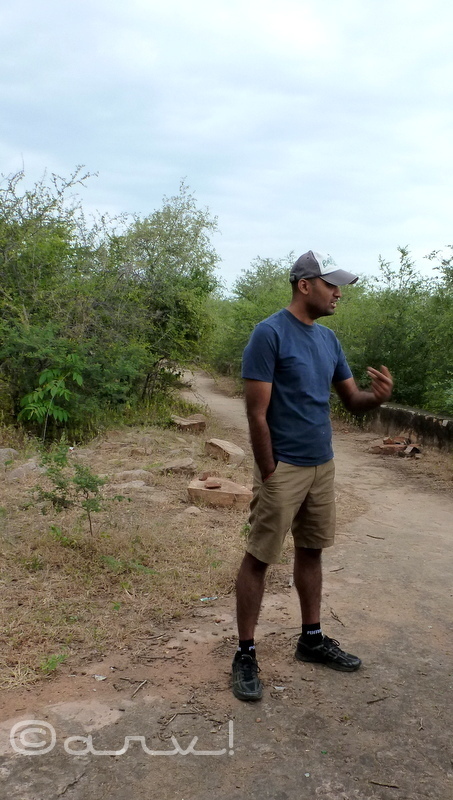 Neeraj, the conductor for this water walk has been conducting Jaigarh water walk for last few years. He completed his post graduation from the USA; worked with the World Bank on water conservation. After shifting to Jaipur, he now focuses on consultancy services and also conducts water walks at Amer, Nahargarh & Jaigarh Forts. His family hails from western Rajasthan, which is a rain deficit region. Incidentally, water resource management is quite strong in the western region of Rajasthan. Nahargarh water walk is being developed in association with the Government of Rajasthan. 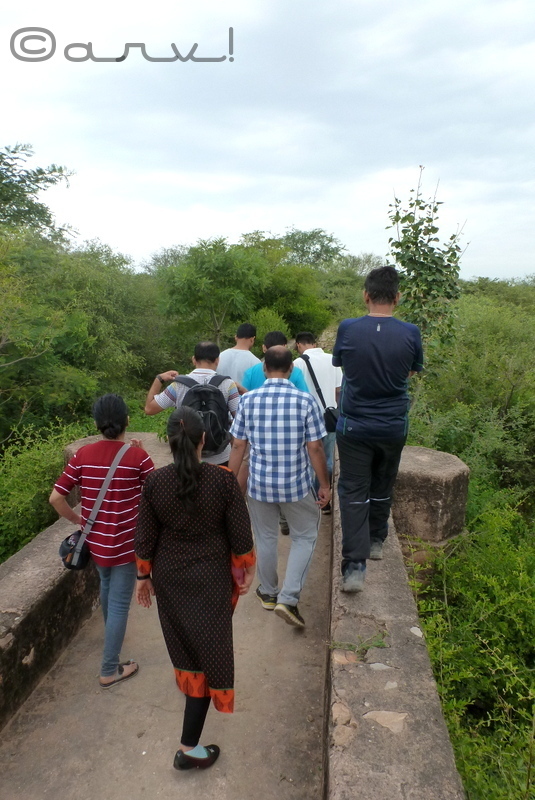 This heritage water walk in Jaipur focuses on the entire system for collecting the rainwater and its storage, which was used a few centuries ago. A large part of this system i.e. catchment area is still intact and functional. The water walk is an eye opener as to how people in those times conceived & developed the concept of water collection & storage systems. Some components of this system share similarity with the ones used in Europe during the similar time frame, especially in Southern Europe! The water conservation program was completely dependent on rainfall. Once collected, the quantum of water could be used for more than a year and thereby making it easier to survive during rain deficit periods. Although the major part of water collection and conservation system is still intact and functional, some sections have been damaged, which seem to be a work of human element rather than efflux of time. 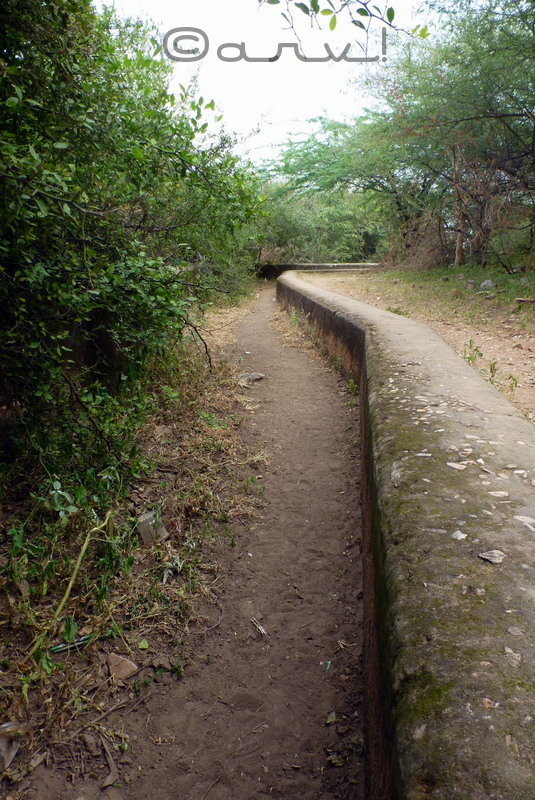 The damaged sections of water channel. The water collected through these channels accumulates in Nahargarh Fort water reservoirs or storage tanks popularly called Nahargarh Baoris. Here are few pictures that explain the system. 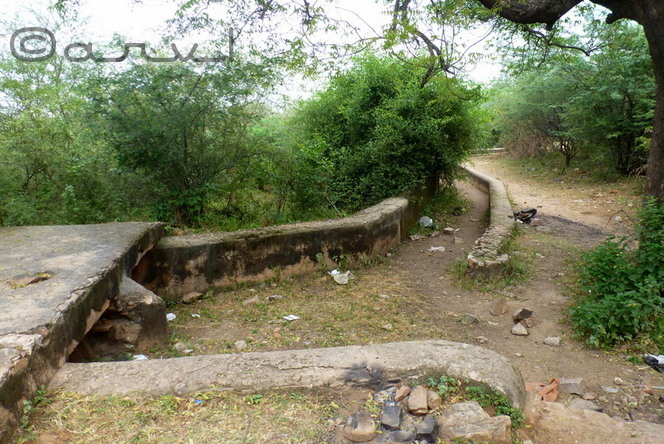 A close up of this Nahargarh Fort water channel. Nahargarh Baori which is part of water collection and rain harvesting system. Here is a panorama shot of the Nahargarh water storage tank or reservoir commonly called Nahargarh Baori. It is impossible to capture this Baori in a single shot! A panoramic shot of the Baori in Nahargarh Fort, used for storing rain water. 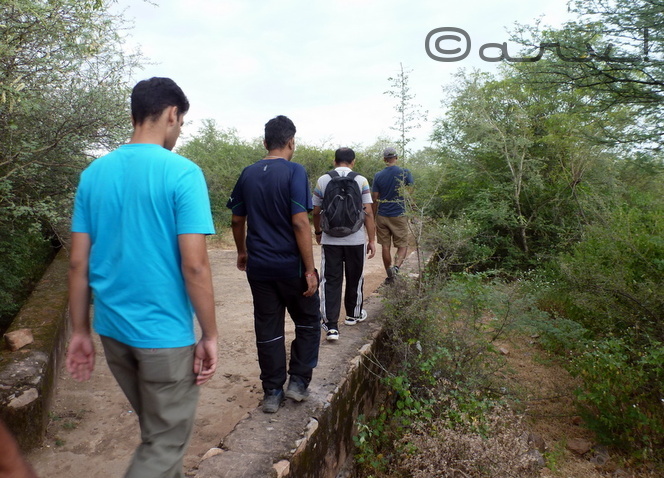 Nahargarh water walk was a great experience and proves how people used to work in tandem with nature in ancient days. Despite living in this city for many years, certain sections of water conservation system especially the catchment area had escaped my attention too. While, we all have seen water storage in Jaigarh, Amer and Nahargarh Forts, the modus operandi was unknown. The current generation is unaware of ancient water conservation systems but it’s important to spread awareness about this forgotten technique. 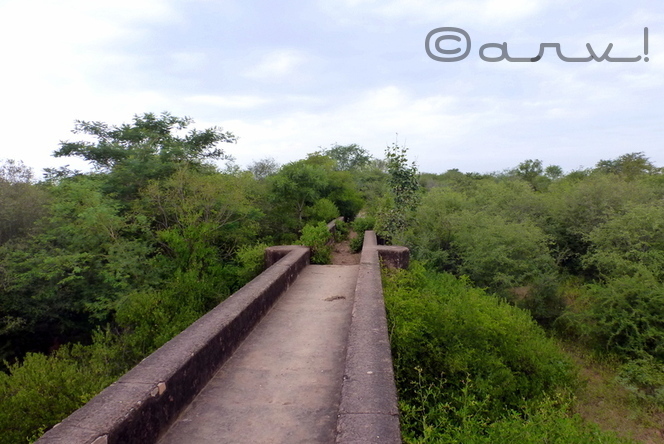 Here is a picture of the Nahargarh water channel during the monsoon. This picture shows how water collects in water channels. Recently, an organization has started offering Nahargarh water walk on Segway to the public which I feel is a bad idea. 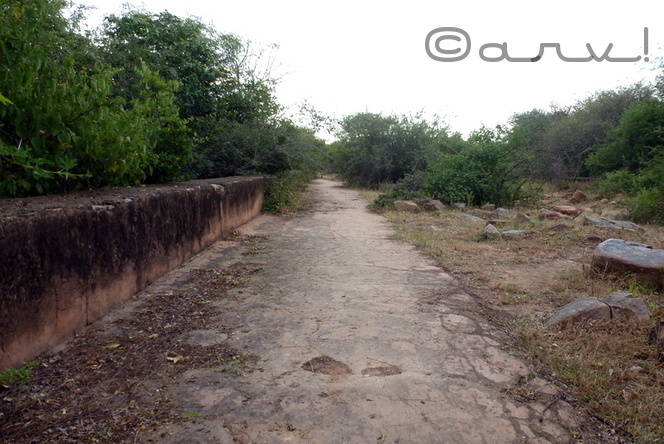 These ancient water channels are in a need of repair; operating segway ride will surely cause further damage. Segway ride at Nahargarh Water collection structures comes at a hefty price. Apart from this, some individuals are offering water walks with no knowledge or background of water management. I feel an expert in water management can do justice to a water walk. Check credentials of the conductor of water walk in Jaipur before undertaking one. 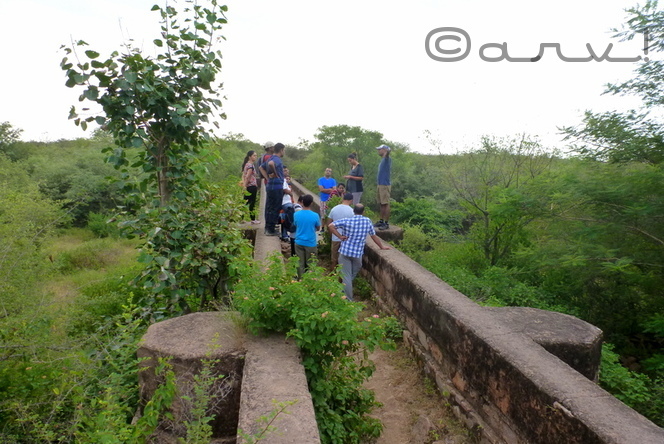 I recommend Nahargarh heritage water walk in Jaipur for the heritage lovers and “knowledge seekers”. Nahargarh water walk will not interest everyone though. To know more about this water walk and how you can undertake one, you can email me -Jaipurthrumylens@gmail.com. Nahargarh Water Walk made its appearance first on Jaipurthrumylens – the best blog on Jaipur. New generation may not even know the source of water in their own house. Water conservation is very serious issue and we really need to take this very seriously. Highly appreciate the efforts Neeraj is taking. We need more such Neeraj everywhere. When we were in Jaipur we stayed at low budget hotel. We asked for hot water and the guy said leave the tap open for few minutes and the hot water will start flowing after some time. We might have wasted buckets of water before we get the solar heated water. If this thing can happen in Jaipur imagine the rest of India. I hope we can learn from the technique and maybe work on our own to conserve water…Maharashtra has a lesson in hand! This is an awesome post…a virtual tour of water conservation system! Very nice article I must say! A great and applaudable step taken towards water conservation. Today we see lots of issues prevailing in different states of our country due to water shortage. With such steps, I believe we can see colorful results. This is a very interesting and informative walk and I must confess I didn’t know anything about this heritage. I am proud of persons like Neeraj and all those who are passionately following such programmes. Thank you for highlighting those efforts and being a part of this walk. These pictures speak volumes about the wisdom of those who created all those channels to conserve water. Balroop! I am happy that you liked it! Yes, we need to appreciate Neeraj for his efforts to conserve this knowledge and pass it on to future generations. Even though I have been to Jaigarh and Nahargarh but never thought of the places from a water management perspective! Mridula! These water walks are not on Commercial lines and would interest select few despite the fact that these are quite interesting. Do undertake one when ever you are visiting the city. Brilliant article , thanks for bringing this to us Arv :). Where there is a will, there is a way 😉 Cheers ! Lovely shots of the walk! Pingback: 2015/Reflections- Top Posts… | Jaipur thru my lens !! A very interesting and pertinent topic for an arid region. The town planning during those periods were always done with a strong focus on the water collection systems. True Somali.. if you look at any civilization.. Egyptian, Indus etc they all developed on rivers! Water was and will be important to us, after all our lives are dependent on it in more than one way. Can one do this trail in a Cycle? Any permits required? It would be useful if you could mark it on google earth and share a screenshot of the trail. It’s possible only in certain section. And you need to carry your cycle till that point. 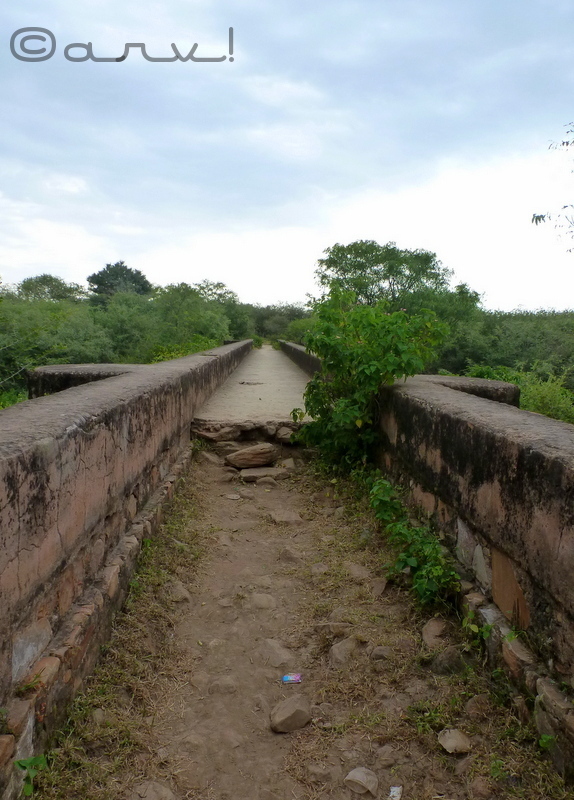 I will not suggest cycle on this channel as these are heritage structures which have weathered over last 250-300 years. cycling will damage them further. some sections of this channel have already been damaged. given the fact that techniques used in construction of these channels were different and we don’t use them anymore, repairing is challenge. I have met with people who would like to get such heritage structures repaired with same techniques but are forced to use brick and cement due unavailability of trained manpower. There are other interesting places where you can cycle in Jaipur though! Thanks. I understand. Maybe a day hike is more prudent! 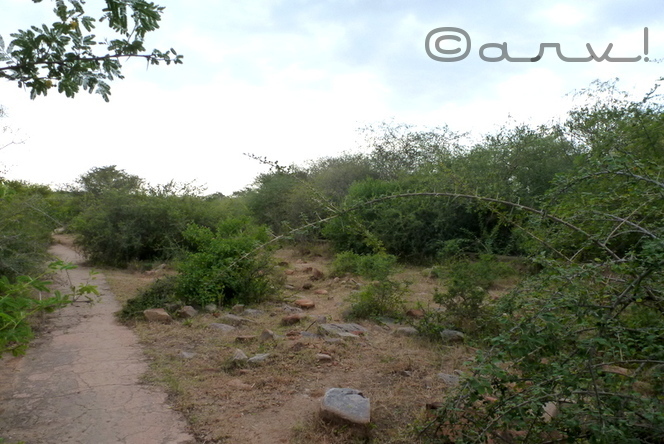 P.S – Please do share off trail cycling trails recommendation in and around Jaipur City. Sure I can. I can also connect you with right people. you can send DM to me on instagram. Btw the authorities have just approved water walk on these channels on Commercial scale, so it’s unlikely to approve cycling on this water channel. Lovely lovely post sir. It is high time water conservation efforts are stepped up, due to erratic rainfall patterns these days. Yes shubham! Btw these walks have not been officially launched by the authorities. When will be the next water walk will be organized. I am very interested in joining it. Also how can a person can understand the whole water harvesting concept in Jaipur. Pls mention your email. Will forward you details. 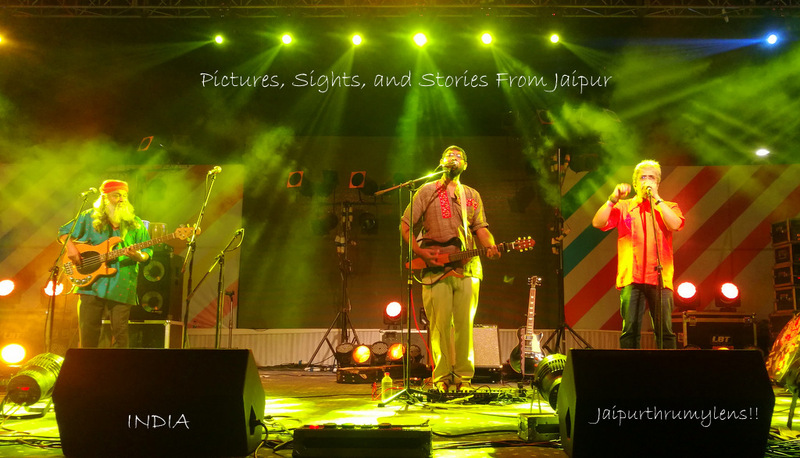 Pingback: Heritage Walk in Jaipur/ Square by foot – Jaipur thru my lens !! The water walks sound an excellent idea. I know the conservation of water is vital in many (most?) parts of India where the rainfall is little or unreliable. Suitable, tried-and-tested methods of collecting and storing water are equally important. Neeraj Joshi is doing an excellent job in trying to educate people about all this – and all during these very enjoyable walks. I had once walked on one of the Micronesian Islands that had roads like these, deep within its jungles. I agree with the folks above, good pics! Thank you! Micronesian Is? Sounds interesting. Did you make a post out of it? This is awesome. The irony is that people were much aware of the importance of natural resources and the need to preserve and conserve them. Where, today, despite having modern techniques, skilled labours, and knowing the fact that we need to conserve water and other natural resources are taking them for granted and wasting with open hands. 😦 Beautifully written post, and much thanks for the virtual tour. 🙂 cheers! That’s the problem, Rashi. we have forgotten the basics because we have created alternatives. Sooner or later we will realize this. Have you ever visited Jaipur? wow! so you have relatives/friends here? we should catch up whenever you are in Jaipur…next! Oh yeah… I have a like an army of relatives in Jaipur (sometimes, it’s scary. Esp, when ur on a vacation n u don’t wana turn the trip in a family gathering). Sure, so you’re a native? great! I can understand… yup!